Whether it is to provide a friendly welcome to visitors or customers entering a company building, engage employees, collaborate more effectively or present annual results to shareholders, AV systems play an ever-growing role in today’s corporate strategy. 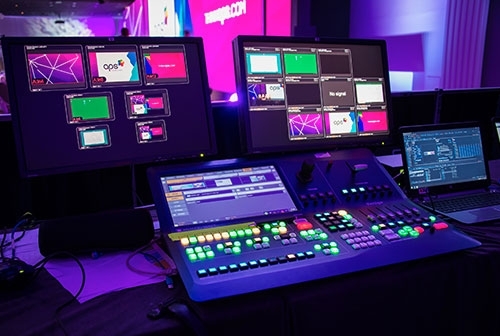 To assist companies in improving their external and internal communications, Analog Way offers a complete family of powerful video processing solutions tailored for a variety of corporate projects needing smooth, effective and creative visual reinforcement. Additionally, world-class customer support from concept to outcome ensures the delivery of a fully compliant and well-integrated timely solution. From small boardrooms and training facilities to large-scale auditoriums, corporate lobbies and experience centers, Analog Way's processing and video playback solutions can produce images at any size or resolution and help organizations deliver their messages clearly and in the most creative and appealing way. To ensure confidence and peace of mind, Analog Way’s devices are all engineered and built to the highest standards in the AV industry for maximum reliability and optimized uptime in 24/7 applications. In addition, Analog Way provides system integrators and developers with all the tools they need to design elegant custom drag-and-drop remote control solutions with minimum programming and seamlessly integrate its image processors and media servers into any customer’s environment. Busch Home Theater expands technical and creative capabilities of San Francisco based global design company with Analog Way's NeXtage 08 - 4K Seamless Switcher. 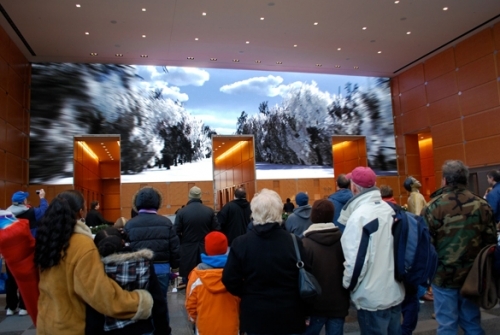 The Comcast Experience has begun this year’s Holiday Spectactular at the Winter Garden in the lobby of Comcast headquarters in Philadelphia where two Analog Way Ascender 48 systems drive one of the largest 4mm LED wall installations in the world.